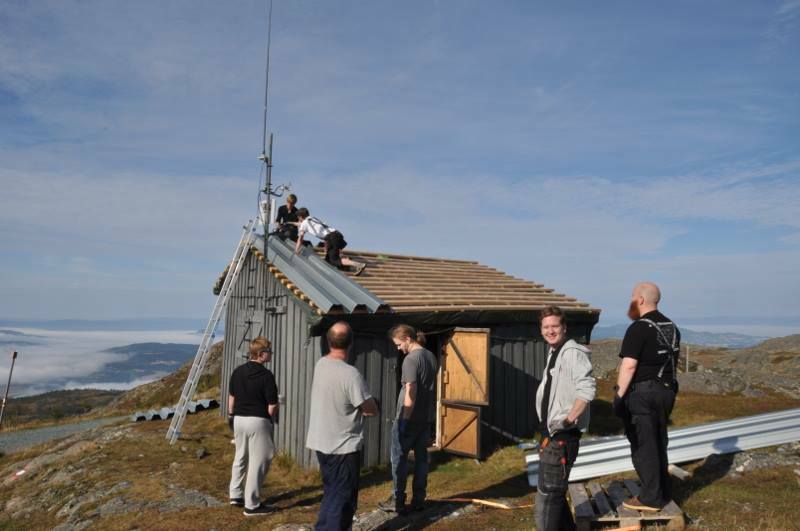 ARK develops and maintains some radio beacons from JP53EG at the top of Vassfjellet, a local mountain. The beacons can be heard on the following frequencies. If you hear any of the beacons we would love to hear about it at la2vhf or la2uhf@la1k.no. 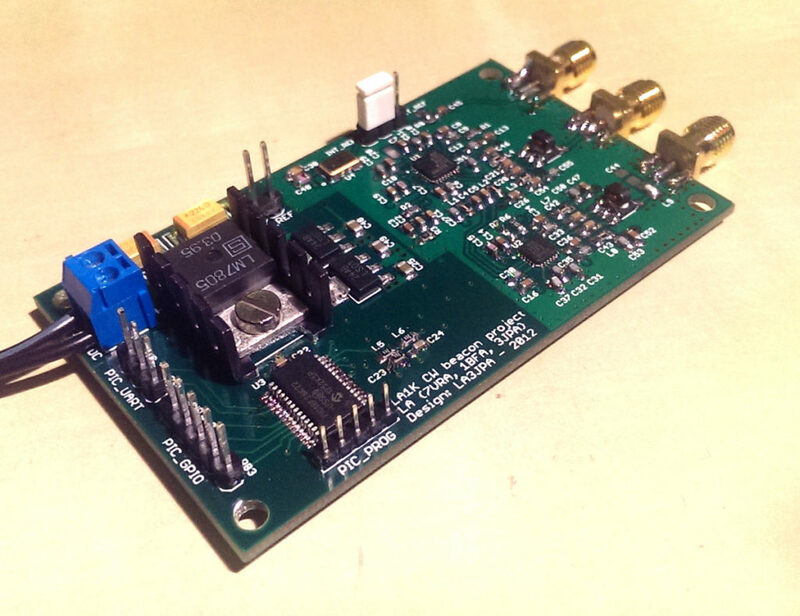 Back in 2012 Jon Petter, LA3JPA, designed a 35-4400 MHz CW exciter board (seen in the left picture below) that is the main building block used in the LA2VHF/4m beacon. The CW beacon project is made open source and can be found on this github page. The cabin that houses our beacons is placed near the foot of a 196 m tall telecommunications tower. When icicles fall from this height they have a tendency to pierce the roof on our cabin, therefore we reinforced the roof with steel plates (building progress seen to the right above) in the summer of 2016. 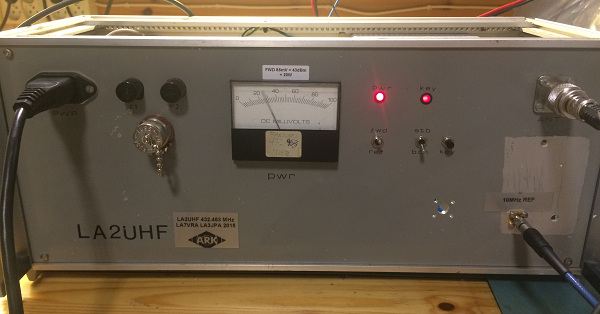 We also got a working 5.8 GHz data link between the cabin and our main shack at Samfundet. As soon as the snow melts and we have access to the mountain top again we will work on improving the stability of this link. We also have some other exciting changes to the beacon setup. In the recent years we’ve become particularly interested in the 6m band, dubbed the magic band for the way it suddenly opens and closes. To get an indication of when conditions are good we are hoping to expand our lineup with a 6m addition to LA2VHF in the summer of 2017. Actually we’re well underway, we’re just missing power amplifier (PA), band allocation and final integration at this point. On the PA side Jotron donated some power transistors and matching 28 V supplies, speeding up the process immensely. Another blog on the design of this PA will pop up in the months to come. On 70 cm we’re changing the antenna from a 10 element yagi to a big wheel antenna. This is because the main mode of propagation is likely to be via tropospheric ducting, where the antenna gain at each side is not the limiting factor. The big wheel antenna is an in-phase stack of three horisontal loops, yielding an omnidirectional horisontal pattern, with improved gain compared to a single loop. This we believe will improve the chances of this beacon being heard out there as the improved tropospheric volume coverage by going from narrow beam to omnidirectional is considerable. The big wheel is also a prime candidate for the 6m and 4m beacons, this is primarily because most operators on these bands use horisontally polarised antennas. For 2m the main mode of propagation is aurora scatter, where the antenna gain does matter. So we will stick with a yagi for this band.